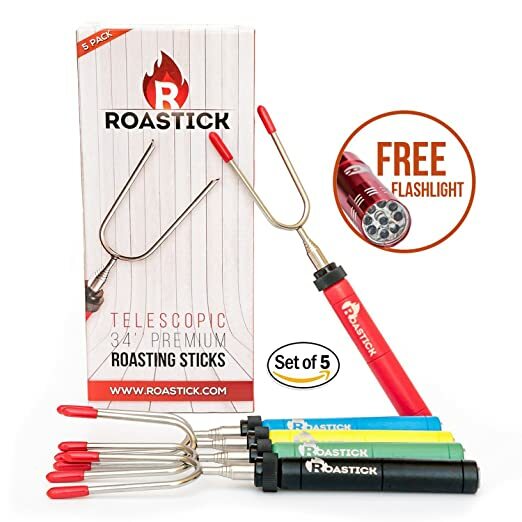 Grab this set of Roasting sticks for ONLY $7.50 with Amazon prime. Grab a code from the gleam at bottom of blog post. Great for smores! THE NEWEST ROASTING PACK: Set of 5 Colorful Rotating & Telescoping Forks. FREE Pouch Travel Bag and Amazing BONUS- Mini LED FLASHLIGHT (With Batteries). PERFECT For Roasting S’mores, Hot Dogs and Wieners on an Outdoors Campfire, Backyard Fire Pit, Bonfire, & BBQ. PREMIUM QUALITY MATERIALS: The Non-Toxic Stainless Steel Skewers are BPA Free and will Never Rust or Bend. Roastick Guarantee the BEST Roasting Experience. Our New Design Wooden Handle is Heat-Resistant and Provides a Much Better Grip. Customized Prongs Tips Will Keep The Roasted Marshmallows Steady While Under Blazing Fire. SAFE FOR YOUR CHILDREN: The 34-inch-Long Extendable Telescopic Sticks Will Keep You and Your Loved Ones At a Safe Distance From Any Fire Pit, Campfire, Bonfire & Outdoors Grilling. The Sharp Prongs Tips With Rubber Protection and The Heat-Resistant Wooden Handle Will Ensure a Safe Environment For Your Family & Children Around The Fire. THE BEST ROASTING EXPERIENCE: Roastick Wants To Create Incredible Memories For You and Your Family While Roasting The Most Delicious and Incredible S’MORES Out There. The 360° Rotating Axle Allows Everyone To Make Testy Roasted Marshmallow BY Using Only The Flicks Of Their Fingers. Finish Using It? NO PROBLEM! The Non Stick Forks Are Made For EASY CLEANING. Retracting To Only 10 Inch Makes It Ideal For STORAGE And CARRY around the house or In The Wild. LIFETIME WARRANTY GUARANTEE: Making Our Customers Happy Is Our Main Goal. We Are Committed To Putting a 5-STAR Smile On Your Face. Roastick Is Bound To Assist And Address At Any Product Issues. Our Clients Satisfaction Will Always Be Our Top Priority.